Is it true that people in hell believe in personal evangelism, but people on earth do not? Boil chicken in broth. Cook spaghetti in broth after removing chicken to cool, and then cut in pieces. Saute onions, celery, and bell pepper in butter for 5 min. Mix all ingredients together except cheese. Put in a greased 9×13 and top with cheese. Bake at 350 degrees for 35-45 minutes. One billion minutes equals about 1901 years…so it was 109 A.D. Awhile back Noah and Isaiah were playing together, and both were wearing their fireman’s hats. Isaiah did something Noah didn’t like, so he came to Leah and was telling her about it, and at the end he said, “…then he hit me hard on the hat!” Instead hitting him on the head, he hit him on the hat . I love the top photo. 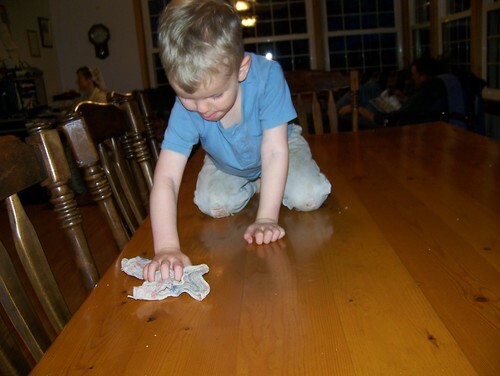 How his jeans are dirty with holes in them, yet he's cleaning off the table. So cute! ok well i'll sys ttyl!!!!!!!!!! The farmgirl fun stuff is really interesting!!! I really like Seven Sisters Treasures….